In addition to being the West Coast’s premier surface protection provider, Builders site Protection also specializes in a wide array of abatement, containment, and remediation products and supplies. One such popular containment system is our Mobile Containment Cube. Mobile Containment Units are are systems designed for work in an environment where contamination cannot happen, and negative air filtration is required. Typically construction and maintenance work in hospitals, labs, and high tech facilities necessitate the use of containment units. Containment carts such as the one pictured above are collapsible and mounted to mobile carts, allowing them to quickly be moved and stored. Containment units are built to be compatible with negative air scrubbers. Using exhaust ports built into the containment unit, and air scrubber can be connected to the unit, providing negative air to prevent contamination, and providing HEPA filtration to meet strict contamination standards. 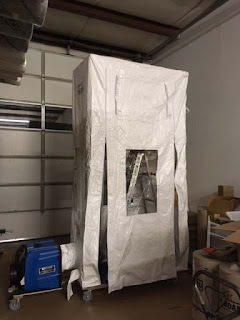 Air Scrubbers are not included with containment units, however they can be ordered together, and we do carry a number of air scrubbers on our website. Because systems like these are designed for hospital use, they meet extremely strict standards and regulations for fire resistance. This particular unit is certified with the CA Fire Marshall, and is compliant with CDC, AIA, NFPA, and CSA standards. This entry was posted in Exciting New Products, RRP Compliance, Uncategorized and tagged mobile containment unit, new products by admin. Bookmark the permalink.